Somewhere along the way of my Alphabet Challenge, I lost my path and started speaking in tongues, which made my order slightly questionable. Well, I’m back, from outer space, and am restarting with the letter E.
E is for Elk Cove Pinot Noir, from the Willamette Valley appellation in Oregon. Now, i am new to the world of Oregon Pinot Noir, and i find it very much hit or miss. for the most part, I enjoy the subtle earthy spice that Oregon Pinot displays, but sometimes it can be over the top. The Elk Cove Willamette Pinot Noir is a blend of several vineyard sites, and aims to show the best of their style off. very affordable example of Oregon Pinot Noir. I definitely recommend that you BUY it, and would encourage you to decant it for maximum enjoyment. After our adventure barrel tasting at Cartograph, we were lucky enough (ok fine, Alan knows people) to be treated to a very special private tasting at Arista Winery. I’ve been to Arista before, and have always enjoyed their Pinot Noirs, but this was realy a treat a we were able to taste 7 older vintages of rare wines. Mark McWilliams met us outside with a plethora of older vintages and we were wowed by some of the Pinot Noirs from Arista. Arista Winery was founded by the McWilliams family in 2002, with the intention of creating world class elegant Pinot Noirs from the Russian River valley. Creating wines in the vineyard with sustainable practices and small lots, each wine is an expression on the local terroir. OK yes, fluff and bother but true all the same. We started with a Longbow vertical. Longbow is known for it’s blend of the best barrels, and for creating a more powerful style. As a general rule, it is unfined and unfiltered, and uses the racking process as a natural filter. the Longbow series is minimally invasive, which allows the fruit to really show throguh. Named for the midevel weapon that is very difficult to master, the Longbow series really shows the best of the bunch with Pinot Noirs that are difficult to master. Megan is working very hard on her Pinot! The 2004 Longbow Pinot Noir was dark and rich, with powerful black cherry and raspberry flavors. 2004 was a warmer year, and more new French Oak (60%) was used to counterbalanced the strong fruit. This is a blend of the Manoni and Taboni vineyards, and the vibrant cherries were followed by a chewy and rich flavor of stewed tomato, caramel, and balsamic strawberries. the 2005 Longbow Pinot is slightly lighter than the 04, and showed more muddy earth flavors of allspice, nutmeg and black pepper. I tasted forest floor and mushrooms, with bark and cedar followed by cola and hints of red fruit. The 2006 was very aromatic and had strong rose petal aromas, with orange blossom notes. It is primarily clone 113, and was very herbaceous with herbs de Provence, meaty earth, and less pronounced fruit. there was a strong sense of smoke and sandlewood, which dark plums lingering. It was quite smooth and velvety, but a bit too smoky for my taste. Don’t get me wrong, I really liked all of the wines, but this was my least favorite of the batch. 2007 was too young, and the finish fell a bit short. there was a lot of vanilla and cherry, but I also found tomatoes and soy sauce. The wood was a bit too pronounced and needs more time to integrate. I actually really loved all of the Longbow wines, and they are all very different. My favorite was the 2004. Next we moved on to some barrel samples with the 2009 Two birds Swan Vineyard. this was a HUGE wine, and I referred to it as my hunka hunka burning love. The 2009 Two Birds Calera Selection was a completely different wine, with acidic zippy cherries and raspberries and bright red fruit. It had a lot of spice and slightly muted earth. Special thanks to Alan & Mark for yet another great day out at Arista! I first found MacPhail Wines at a tasting held at San Francisco Wine Trading Company last year, at the recommendation of my friend. Since i know he is a bigger wino than I am – NO! It’s true Alex you are! – I couldn’t miss it, and I knew that I would be blown away. BOY was I not wrong! At the time, I was pinching the employment pennies and only walked out with one bottle of the Sonoma Coast which I am treasuring like a pot of gold. Recently, my wino friends Jim, Shana, Vicki and Lil and I snuck in an impromptu visit with James and his dog, Zuni. I am in love. Pure, magical, pinot love. One was better than the last, and the last was better than the first! MacPhail Family Vineyards was founded in 2002, with a directive to create passionate Pinot Noir from the best Sonoma and Mendocino County sources. To that end, here are my yumyumyummy notes from our visit! 2008 Rose of Pinot Noir was a deep rose hue, and smelled of rose petals, hibiscus and cranberry. I tasted the cranberry and hibiscus as well, along with red ziner, rich red fruit, and grapefruit. 2007 Sonoma Coast is a blend of two vineyards, the Pratt Vineyard and the Goodin Vineyards, both of which are located in Sebastapol. These wines were vinified separately, and then hand picked for the single vineyard wines. The remainder was blended in to this treat, which showed spicy clove, dusty cherry, black cherry, even a touch of blackberry, followed by Dr. Pepper, and dark rich intense flavors. 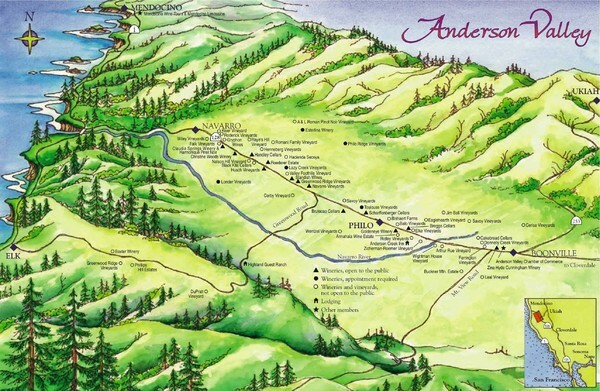 2007 Anderson Valley Toulouse Vinyeard is a combination of a the Dijon clones 115, 667, 777, and 2A. MacPhail is one of the premier examples of a Toulouse pinot, and one of the first. This is a big pijnot for Anderson valley, and was full of bright strawberries, salty creamy berryies, lots of earthy bark and cinniomn. It had a lighter body and color and was zippy. 2007 Sonoma Coast Goodin Vinyard had a rich, deeper color. I loved the rich, spicy earth flavors. Lots of Dr. Pepper and black cherry. Dark delicious ruit. 2007 Anderson Valley Vagon Rouge was a very special wine indeed! Only 8 barrels were made, and it had wild strawberry, rich intense fruit and bright red berries with a nice balance. Strictly speaking, I loved ALL of these wines. I left with 3 bottles to add to my 1 at home, and I will remember my visit for a long time. I look forward to coming back and tasting again next year! A pinot that doesn't fail! The 2008 Split Rock Vineyard, Sonoma Coast Pinot Noir comes from the Gaps Crown vineyard, in the southern Sonoma Coast appelation. Again, this area has the cooling influences of ocean fog, but the Sonoma Coast appelation provides a different flavor structure. The Split Rock section of the vineyard is planted between 300-800 feet, in rocky soils. Another personal favorite from Gaps Crown is the Humanitas Gaps’ Crown Pinot, and i plan on doing a side by side when the Stomping Girl gets released! I found this pinot earthly, with tons of sour cherry and Dr. Pepper flavors. Recently, I was lucky enough to attend the 7th Annual Passion for Pinot Summit. This was an opportunity for the Pinot Noir lover, Press & Trade to get together and have a Pinot Noir Taste-Off. This is a unique event that really pulls the lid off of wine judging, and allows the average Josephine to become a wine judge for a day. While the officially judges taste 32 wines each day for an eternity until the contenders were whittled down, the attendees at the Summit were given the top 44 wines to taste blind in The Final Showdown. Additionally, the attendees at the Pinot Summit got to vote on our top 3 wines, in a Girls vs. Boys challenge, that shows us that there really is a difference in biological palates. Below are my tasting notes from my favorites, plus the group winners by gender, and the over all judges winners for kicks. I’ve also included some tasting notes, just cuz, well, they help! Here are my 90+ pointers. Once the business was out of the way, the wines were unveiled, and we were invited to the Grand Tasting reception. This was when we matched our favorite wines, previously only identified as colors, to their names. This was also when we could see the medal winners from the official competition, as well as try some other offerings from the participating wineries. Purple, Red, Coral, Khaki, Black & Periwinkle all ended up on both winners plates! Thanks much to Affairs of the Vine for the invitation and the fun day! I hope everyone goes out and buys Pinot. There are great finds at every price point, and it’s a very versatile beast.